Cheapest longest receipt I’ve ever seen – only £35.86. 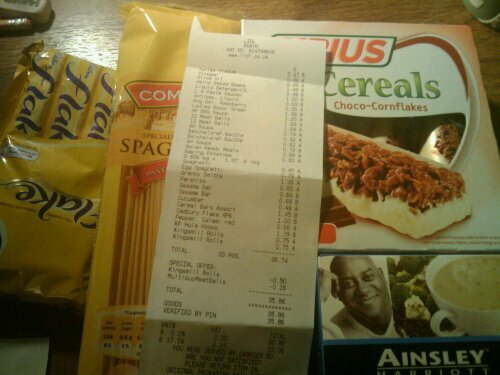 So I went out again today, ready for an absolute bargain fest and thought I’d try our European friends – Lidl. Now, the only option at Lidl is really to get a trolley and go for it. I’ve never seen much point in going there to shilly shally about (thank you Oscar Wilde) with a basket and get “a few bits”. This is an alien idea for me anyway when it comes to food shopping but at Lidl, in particular, I find it much more of a 4-tins-of-chopped-tomatoes and 3-huge-bags-of-rice sort of shop and today was no different….highlights were definitely really nice Italian balsamic vinegar for 99p, 24 I mean I should really write that out: twenty-four meatballs for £3 (and they taste pretty good too) and 4 flakes for a pound on top of that. I mean, I really outdid myself here. Sure you have to settle for not the known brand but they really do all taste and work the same. A lot of my friends also say that I’m brave eating the meat and veg from Lidl; that they go off really quickly but that just makes me think what other supermarkets must be putting on their food. Ponder that if you dare. Anyhoo, the real important part of this little jaunt, was of course the quest to find the reduced aisle. I looked at every section, on every shelf and still no reduced items. The only thing for it really was to ask the poor man on the till who seemed horrendously confused by my request. He, out of what seemed like a pure feeling of fear, pointed me in the direction of the special offers section but alas it is not the same. Having realized, rather sadly, that not every supermarket automatically has a daily reduced aisle, I’ve come up with a handy little Google map for all the shops I’ve been to in Cardiff that do. Please add to it if you know of any others…location in the shop is an absolute must if you can – don’t want to be wasting time wandering around trying to find the aisle whilst that old lady who seems so smiley is allowed to rush straight up and prize those pork medallions. Damn her, she’s always there. ← This is going to be the start of a very beautiful foodship.